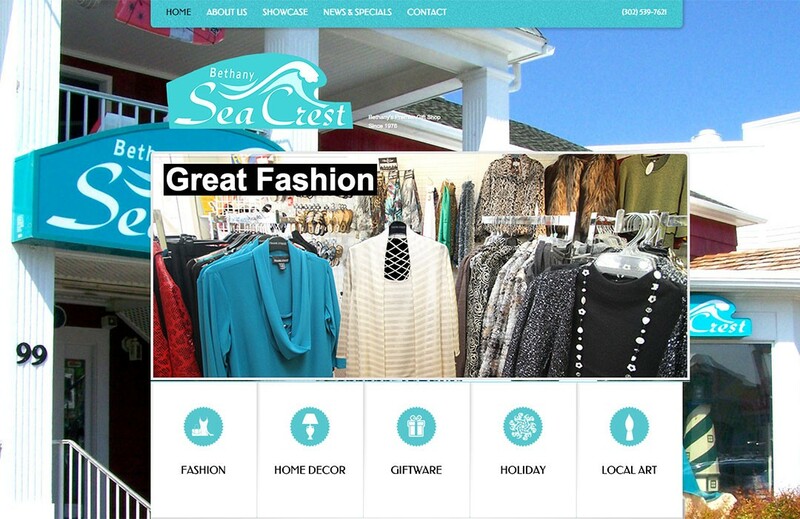 Sea Crest has become an iconic place for shoppers, browsers and pedestrians over the decadesSea Crest is located in one of the oldest structures in downtown Bethany Beach. Originally a motel, the property was sold in 1976 to Freda Kimmel who added the boutique and gift shop. When she retired in 1991, Brian McKinney became the owner and Liz Hammond stepped in as manager. Today, Liz and her husband Eddie Hammond have taken over the store and are carrying on the stores tradition as an eclectic venue for such items as home decor, holiday gifts, hand painted glassware, unusual wall-clocks, fashionable women’s clothing and accessories, and jewelry. There is something for everyone, in every price range. When Liz and Eddie took over the store they contacted NBR Design Studio to give them a fresh new presence on the internet that would show off their eclectic nature and feature a good sampling of the items in the store.NBR gave them a new logo and a bright and colorful website that compliments their product and their location at the beach.